Blog - Luskus & Fuelleborn P.C. Life insurance policies can serve many purposes, but the most basic reason to buy life insurance is to replace your income if someone else is depending on it. If you have young children, in most cases you should have a life insurance policy. If you have a spouse who depends on your income, in most cases you should have a life insurance policy. If your parents have co-signed a large student loan for you, in most cases you should have a life insurance policy. There are only two types of people who probably do not need life insurance: 1) single people that have no children and no adult dependents and 2) very high net worth individuals that have no debt. Whole life vs. term – what is the difference? There are two basic types of life insurance, whole life insurance and term life insurance. Whole life insurance, as the name implies, is a policy guaranteed for your whole life. Some of the money paid into your whole life policy accumulates “cash value” in the form of a tax-sheltered investment account that the policyholder can borrow against. Term life insurance works just like your automobile insurance policy: you pay a premium each month or year for a certain amount of coverage, and that premium is guaranteed for the term of your policy. Typical terms are 10, 15, 20 or 30 years. If you continue paying the premium and die during the term, the policy will pay your beneficiary the face amount of the policy. Term policies are generally very affordable. For example, a $1,000,000 twenty-year term policy for a thirty-five year old male nonsmoker, would cost approximately $400 per year. So, for only $400 a year, our hypothetical man’s family would receive $1,000,000 if he were to die during that 20 year term. Which is better for you, whole life or term? Insurance companies tout whole life policies as a way to leave a financial legacy to your heirs and as a good investment tool, but, because whole life premiums are significantly more expensive and rates of return are so small, you are almost always better off buying a term policy and investing the difference yourself. However, some people, due to health or age, are unable to qualify for term policies, which usually require a basic physical, so whole life may be the only option. 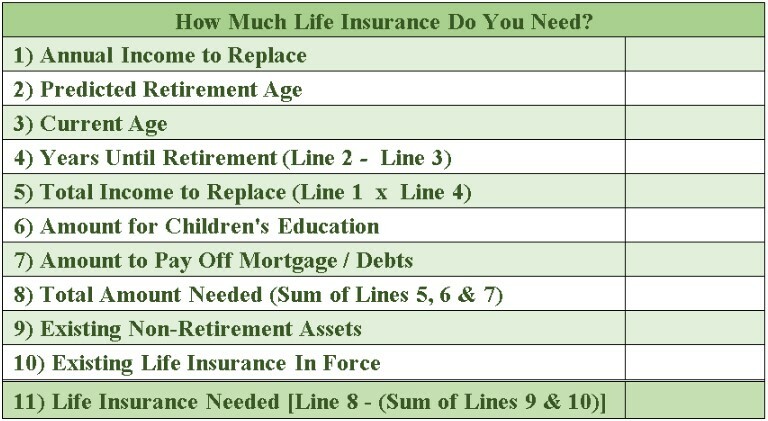 How much term life insurance do you need? How much life insurance you need is both somewhat subjective and a moving target. Your life insurance needs may be quite different in five years. Put simply, in the event you die, you want life insurance payouts to allow your spouse and children to continue their lifestyles without worrying about money. You may also want to provide for future expenses like your children’s education or a wedding. You may want your parents to be able to pay off the student loan or mortgage they co-signed for you. If you have investments or other assets, however, you may only need enough life insurance to make up the difference between your assets and your family’s potential needs. The chart on the right is a good tool to figure out a ballpark for your life insurance needs. When calculating how much life insurance coverage a family should purchase for a stay at home spouse, look at how much it would cost to pay others to perform functions currently handled by them. Salary.com published a recent study that estimates that stay at home moms work on average 94 hours a week and are worth an equivalent salary of $113,000. You also many want to take into account paying off the home mortgage to free up that monthly cash flow that could go toward taking care of our kids. Where can I shop for life insurance? I recommend the website https://www.term4sale.com/ for comparing term life insurance quotes (I have no affiliation with this website, nor do I receive any compensation for recommending it; I just think they do a good job comparing policies). 2018 is quickly coming to a close, and with it, the close of the 2018 Tax Year. While no one needs more responsibilities in December, if you add these to your list, you will thank us when you do your taxes in April! 1. Make Contributions to 529 Plans. If you are saving for college, squeeze in any last contributions before December 31st. For Pennsylvania state income taxes, these contributions are tax deductible, so be sure to include a print out or summary of your 2018 contributions when you meet with your tax advisor! 2. Be Charitable. Make any last minute monetary charitable gifts or in-kind (non-cash) donations. Have the kids clean out their toys before Santa visit, but don’t forget that for non-cash charitable contributions over $250 you'll need a receipt that includes a description of the item and other details. Keep track of your donations to charities in all form and consider strategies that may qualify you for larger tax deductions. Donations for the current tax year must be made by December 31. If you charge your gift to a credit card before the end of the year, it will count for this year, even though you might not pay the credit card bill until 2019. 3. Take IRA Required Minimum Distributions. Friends do not let friends miss RMDs. If you, your family members or your friends are 70.5 and have an IRA, they are required to take a Required Minimum Distribution (RMD) by December 31st. If they do not take the RMD, the penalty is 50% of any amount that is not withdrawn in time. If you have any doubt, call your financial advisor or institutions to confirm your RMD amount. 4. Review Gains and Losses. This is a good time to review your portfolio. If you have lots of gains (lucky you! ), you may want to consider selling some losers to reduce your tax liability. Bear in mind, though, that you can’t buy back the same holding you sold at a loss within 30 days or else you’ll run afoul of ‘wash sale’ rules. And remember that the IRS limits your deduction to $3,000 of capital losses per year (any unused losses can be carried forward into future years). 5. Use your Flexible Spending Account dollars by December 31st. For most plans, it’s use it or lose it; if you have not spent the funds by December 31, 2018, you forfeit them. Do not waste this money! Many nonprescription items qualify, so if you have any unused FSA dollars, maybe some sunscreen or contact lens solution will be your stocking stuffers this year? Luskus & Fuelleborn P.C. is proud to have represented Miss Kesson, a longtime client, and honored she entrusted us with planning her estate. Luskus & Fuelleborn P.C. ensured Miss Kesson's final wishes were smoothly executed and commends the Philadelphia Orchestra for creating the Jane H. Kesson School Concert Program. Jane H. Kesson understood both music and money. Kesson was the only child of a music-loving mother who recognized her daughter's talent and began piano lessons early, and a father who worked for Sears from whom she learned about investing. In music as in life, a lot hinges on who we meet along the way, and for the schoolchildren in the Abington School District who happened to get Miss Kesson as their music teacher, luck was on their side. Kesson led the choir, taught music, and over the decades escorted countless students to the Philadelphia Orchestra. 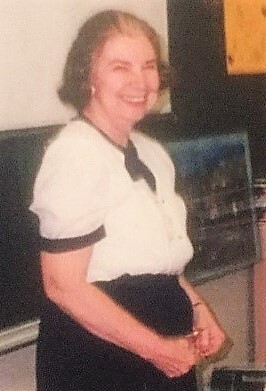 Her onetime students describe her as an unusually charismatic and inspirational figure. Kesson never married or had children of her own, but her name will extend to new generations of budding orchestragoers. The orchestra has recognized her remarkable financial gesture by naming its series of free teacher workshops and related concerts for third- to fifth-graders the Jane H. Kesson School Concert Program. CHANGE IN THE LAW. Congress has just made permanent a great technique for making charitable gifts. You ae now permitted to make charitable contributions directly from your Individual Retirement Account. This is a technique that was approved on a temporary basis in the past, but now you can work this into your charitable gift planning with the assurance that it will be available in the future. In the statute, this is called a QUALIFIED CHARITABLE DISTRIBUTION (QCD, for short). HOW DO YOU DO IT? It is vital that the transfer to the charity occur directly from your IRA account. If the IRA administrator writes the check to you, you lose the benefit of the QCD. The IRA administrator must write the check directly to the charity. WHY IS THE QCD BETTER THAN A DIRECT CONTRIBUTION FROM YOU?If you receive the distribution from your IRA in your name, the increase in Adjusted Gross Income on your federal income tax return may expose more of your Social Security benefits to taxation, can lessen the available amount of current deductions and can limit the amount of the contribution you can claim as an itemized deduction. And, once the Social Security Administration reviews your adjusted gross income numbers, you might experience an increase in Medicare premiums. REQUIREMENTS FOR A QUALIFIED CHARITABLE DISTRIBUTION. There are a few hurdles to jump. First, you must be over 70 ½ years old when the QCD occurs. The charity must qualify for charitable income tax deductions, and the charity must provide written acknowledgment of the gift. IMPORTANT RESTRICTIONS. Simplified Employee pension plans, simple retirement accounts and inherited IRA accounts are not eligible for Qualified Charitable Distribution treatment. The distributions can be made from any other Individual Retirement Account. IF YOU ARE ONLINE, you have digital assets and accounts. These can consist of email accounts, online bank accounts, store accounts and many others. In 2014, 87% of U.S. households had internet access. Most people use the internet. We have files stored on various devices like desktops, tablets and smartphones. What does that mean for our estate plans? A LITTLE BACKGROUND. The Electronic Communications Privacy Act, a federal statute, generally prohibits a service provider from disclosing the content of an electronic communication to a third party except with the lawful consent of the customer. Further, Pennsylvania internet privacy law makes it a felony to access a computer or computer network without authorization. What happens if you are unable to access your accounts because of incapacity or death? ACCESS BY EXECUTORS, TRUSTEES AND AGENTS is beginning to be addressed by some states, but coverage right now is spotty. Without access to electronic accounts, what is an Executor, Trustee or Agent to do in the meantime? AUTHORIZATION LANGUAGE can be inserted into our Powers of Attorney, Trusts and Wills. With the appropriate consent, the Fiduciaries can freely access your accounts, locate assets, ensure that automatic payments can be terminated, protect the privacy of the incapacitated or deceased person and, overall, thoroughly administer an estate. WHAT DO WE NEED TO DO? First, update your documents to insert the appropriate directions about digital assets and accounts. Second, make sure you have an up-to-date list of account information, account log-in data, and passwords available for your Agents and Executors. Keep on Surfing!!! But securely. Every Will names an Executor, the person responsible to administer the Estate. The choice of an Executor is important and cannot be made without a clear understanding of the Executor’s role and responsibilities. In a nutshell, the Executor will identify and gather bank and investment accounts, real estate and any other property owned by the decedent. The Executor will pay all debts owed by the Estate, file applicable Inheritance, Income, and Estate Tax Returns, and will, once everything is done and all bills are paid, distribute the balance of the assets to the beneficiaries named in the Will. Generally, people select family members to serve as Executor. But there are no hard and fast rules. A spouse is often a good choice, especially if he or she is the primary or only beneficiary of the estate. However, if you do choose a spouse, make sure you have chosen an Alternate Executor as well, in case your first choice is unavailable. Children are also frequently chosen as Executors, but be aware that multiple Executors must agree. 1. Choose someone who is competent to handle an Estate and is also willing to take on the personal responsibility for proper administration. This is not just an honorary position. The executor usually works closely with an Estates Attorney, but the Executor still has to be sure that everything is being done correctly. 2. When you ask someone to serve as an Executor, clarify with that person whether the Executor will be compensated. Sometimes, in close family situations, the Executor may devote significant time to the administration of the Estate but feels sheepish about asking for compensation. Executors are always entitled to compensation, so you want to ask your Estate Planning Attorney how that is calculated. 3. It almost goes without saying, but choose someone who is financially and personally stable. In some cases the Register of Wills may require an Executor to purchase a bond. This will generally be avoided with proper drafting of the Will. If a bond is required, however, Executors with bad financial records may not be able to obtain a bond. 4. Choose someone with the highest standards of integrity. The Executor will take control of the Estate assets, will sign all the checks and make the ultimate distributions. Honesty and trustworthiness are the hallmarks of great Executors. If you are ready to create your Estate Plan, or if you have been named as an Executor in someone’s Estate, we are happy to help you.